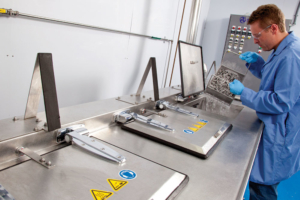 MicroGroup, part of TE Connectivity, has an exceptionally wide range of in-house finishing capabilities, you can select the specialized method or combination of methods, that impart your component with the precise finish you require. Listed below are the in house processes we use to change the finish. Select the specialized finishing method, or combination of methods, from MicroGroup’s exceptionally wide range of in-house capabilities, to impart your component with the precise finish you require. Essential differences between surface finishing methods are outlined below. Centerless Grinding While not considered a “finishing” method in the strict sense, Centerless Grinding is a mechanical process that can improve the smoothness of exterior surfaces of tubing and rod by removing a portion of the surface.